This is just the basics, I'd just like to know if anything stands out as wrong, if you think it looks old school then I'm on the right track. Also working on color scheme for the title, right now I'm thinking of going with blue face and yellow-orange trim. 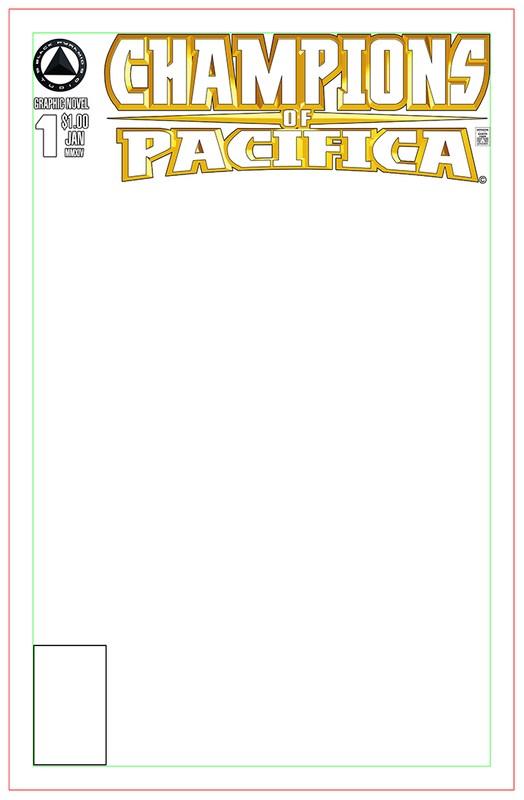 You need to think about the bleed and trim area on your cover the same as on interior pages. Judging by the screenshot, you're working with 6.875x10.4375" (or 10.5") document size. Your bleed area is 0.125" on each side. That's getting trimmed off leaving you with a visible 6.625x10.1875" (or 10.25") as the final dimensions. You CAN have cover dress elements peek outside the live area and onto the trim area, but don't chance it too much. when the bleed area gets trimmed off you'll hardly ever get a 100% perfect trim on an entire print run. Those cuts can be a little off meaning stuff on your trim area will be cut off in unintended places. Left: Right on the left stroke of the barcode box. Top: Somewhere on the black strip right above BLACK PYRAMID STUDIOS and trimming off a bit of the stamp. RIGHT: On the outline of the S in the logo. 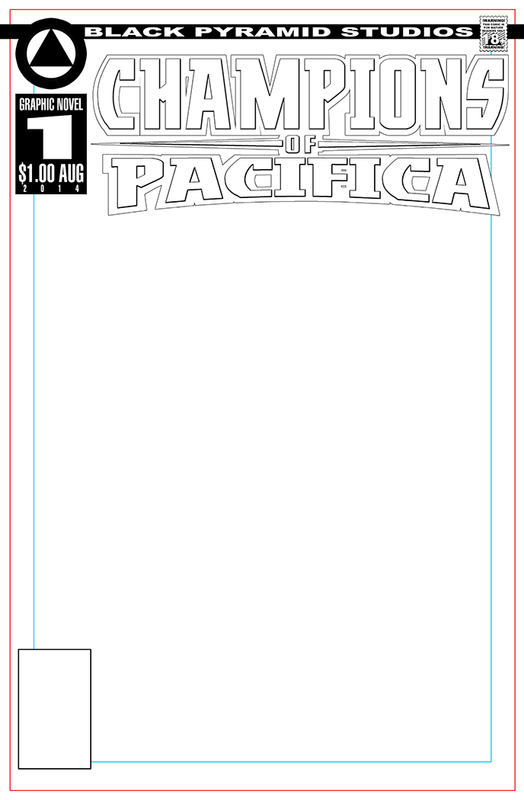 Bottom: Half of the space between the document border and the barcode box. 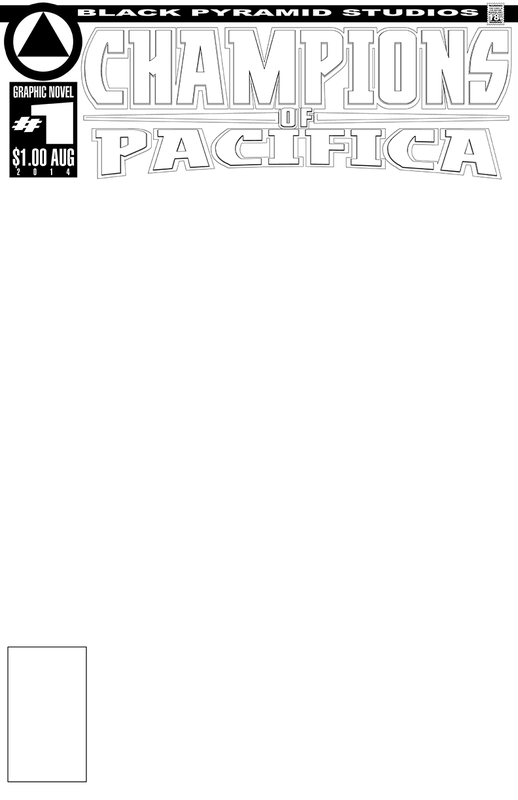 There are also some tangents in the logo caused by the outlines, particularly between OF and PACIFICA. I'd suggest making their outlines as big as in GUARDIANS and combining them all into one, as if the letters are sitting on a plate. 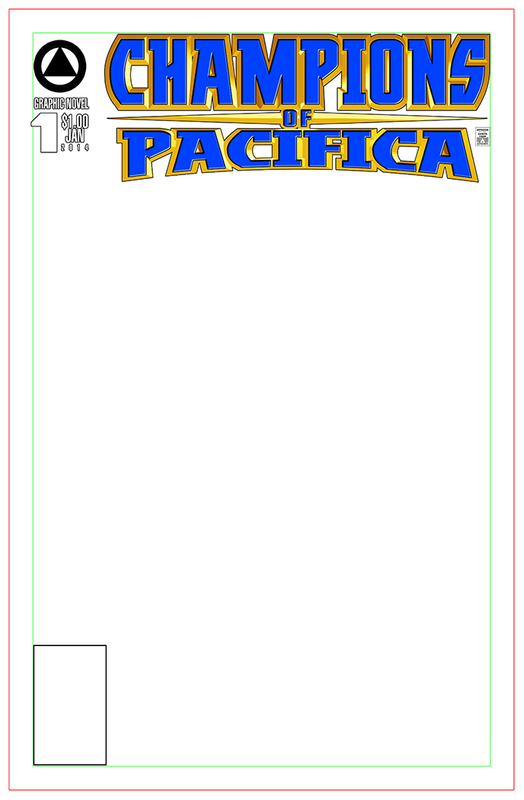 The placeholders left and right of OF should have the same dimensions and also be integrated into this overall outline. Ditch the slim wedges in the M and N outlines, and move the upper corner of the M outline up until those lines are parallel to the M's diagonal lines. You could also nudge the P and A a little to the right for more even letter spacing. Also, the lettering in the BLACK PYRAMID STUDIOS banner just looks like a normal font that's been squashed down 50%. It throws off the balance of line weights in the font, making it less attractive and less not very legible--the S is particular becomes really wonky. Excellent crits Thomas and Jeff! Thomas, thanks for the in-depth overview of how a cover is set up, this was extremely helpful and I have reset my template to match it. Thank you dudes, I knew I would get valuable help here! 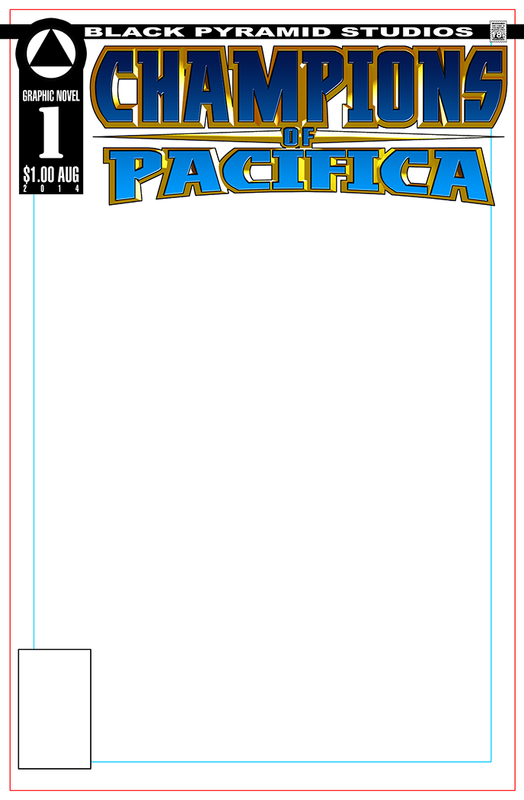 Here's my update, I need to fix the trim on the title but the edges get rounded out in PS, does anyone know how to expand the edges and still make them sharp? I'm not any authority or expert on lettering but I know what looks good and what I like. The Logo is really good. Throw some color on it and I think it would really catch the eye. This would make me want to look further at the comic which I suppose is the point. Thanks very much Coinkadink! I think I can refine it even more, well I'm trying to. My biggest issue is that the light source on the faux bevel is inconsistent. And I'll second what Thomas brought up: You're really tempting fate by blowing past the safe lettering area (blue line). Thanks Piekos, I already reorganized the layout to set everything inside the safe zone, I'll post an update later. I'll go back and make the lighting more consistent with the 3d bevel. Thanks for your input! The logo feels like its battling for attention against the book title because of the proximity and size. I'd adjust the size to be less combative. OK, thanks Ponyrl, I did some tweaks. I would invert the color, yellow for letters and blue for outlines. Or use a lighter blue on top of that golden yellow. The fitted version looks better. IMHO. Last edited by Scribbly; 04-27-2014 at 10:50 PM. Thanks Scribbly! I've tried both ways and don't like them, I think I like the plain white face on the gold bevel, after a dozen tweaks I like this one the most, Here's my final look. I'm no expert in these things, but I've found the best logo designs incorporate themes from the actual book. Take a look at the original "Excalibur" logo from Marvel; it incorporated swords into the logo, probably as an attempt to connect it with British and Arthurian mythology. On it's own, this logo is pretty good. But what's the book about? From the title, I'd guess something dealing with the ocean, a sea-based team. If this is the case, why not try to design a logo incorporating rolling waves or something similar. Something not only used for the logo, but almost emblematic. I appreciate the thought Ad, the book is about superheroes, and I am content with the logo as is.